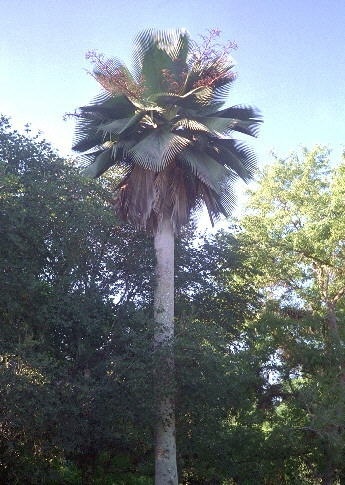 The Brazilian Carnauba Palm (Copernicia Prunifera) is the source for carnauba wax. This palm, also known as “The Tree of Life” has broad fan like leaves attached to toothed stalks, and can grow up to 40 feet in height. The tree even provides waxy edible fruit! In the months of hot dry weather, the plant secretes a wax coating to effectively protect the leaves from damage. Temperatures in the Carnauba growing regions of Brazil can exceed 125F! Leaves are cut during the dry season with long knives attached to poles, usually up to 20 leaves per tree. The leaves are soaked in kerosene or turpentine to soften the wax, resulting in a thick liquid that then is poured into molds and allowed to solidify. The wax is refined and bleached before it is used. A typical tree will provide about 2 pounds of wax from a cutting. (This process is no way endangers the tree) The color and quality are governed by the age of the leaves and the care used in processing the wax. In addition to color, the wax is also graded according to area of origin—Parnahyba, Piaui, Ceara, and Bahai. Carnauba 'Lumps' are weighed and coded for sale to processors and refiners. A temperature of 172 degrees F is required to melt carnauba wax. This is the highest melting point known of any natural wax. Carnauba wax is not readily soluble. Water cannot break down a layer of carnauba wax, and only certain solvents can, usually in combination with heat. Pure carnauba wax is as hard as concrete. A fine carnauba glaze is truly the enthusiast’s choice, providing the coveted warm wet look.Synthetic sealants can last longer, but some (particularly the cheaper varieties) can actually be harmful to paintwork. Waxing your car with a fine carnauba product is truly a labor of love!